OAKLAND, Calif. and MILAN – The new Livescribe Notebooks by Moleskine combine iconic design with innovative technology for a handwriting experience that takes the practice of note-taking to new frontiers. Moleskine has designed a new series of notebooks which work with Livescribe smartpens to capture and transfer notes and images from paper to a computer or mobile device, giving people the ability to access their ideas whenever they need them. Along with transferring their ideas from paper to screen, people can use Livescribe smartpens to record audio linked to their written notes, and can even tag and flag items simply by tapping the on-page icons with the tip of the smartpen. The Livescribe Notebooks by Moleskine feature classic design details including familiar round corners, a ribbon bookmark, elastic closure and the “In case of loss, please return to…” label on the flyleaf. The Livescribe versions include an expandable inner pocket containing two bookmarks printed with smartpen buttons and controls. The paper is ivory-colored and acid-free, providing a clean, crisp surface for artists, writers, teachers, students and professionals to seamlessly incorporate their notes, sketches or drawings with their digital devices. Livescribe’s latest model, the Livescribe 3 smartpen, connects to an iOS device via Bluetooth, sending each penstroke in real time to the Livescribe+ companion app. Other available models include the Livescribe Sky wifi smartpen, which sends notes and synced audio direct to Evernote via wifi, and the Echo smartpen, which uploads notes and audio to a computer or laptop via wired USB connection. 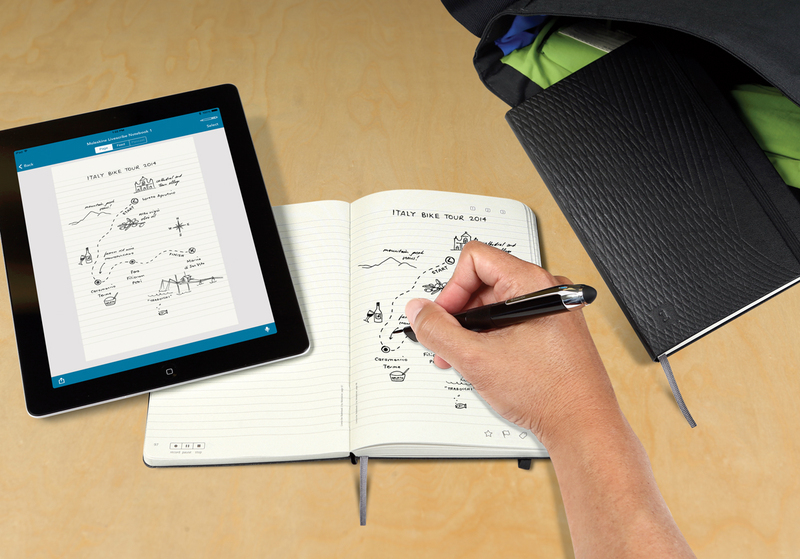 All Livescribe smartpens will work with the Moleskine notebook as soon as any available software updates are installed. Limited stock of the new Livescribe Notebooks by Moleskine, including the #1 and #2 series journals, can be purchased now in the US on Livescribe.com for $29.95 and globally on Moleskine.com/Livescribe for €29.95 and £23.50. Livescribe is the global leader in the design and manufacturing of smartpens, enabling customers to capture, search and share handwritten notes on the digital devices they use every day. Livescribe makes the only smartpens on the market that synchronize handwritten notes with recorded audio, making the ubiquitous pen more useful in today’s world. Livescribe’s family of smartpens include the Echo smartpen, the Sky wifi smartpen and the Livescribe 3 smartpen, with complementary software for each platform. Livescribe was founded in 2007 and is headquartered in Oakland, California. The company has received funding from firms such as Scale, VantagePoint and Crosslink Capital, along with other participants. Follow Livescribe on Twitter at @Livescribe and on Facebook at www.facebook.com/livescribe. Moleskine is a brand that encompasses a family of tools for creativity and productivity: notebooks, diaries, device covers, journals, digital apps, bags, writing instruments and reading accessories. They are the essential objects that we keep close as we navigate our physical lives and engage with our digital communities. They are the objects that identify us wherever we are in the world and invite us to imagine what will become the cultural heritage of tomorrow.